Being the First Prize winner of four international competitions; Trakya International Competition (2002), V. Antonio Janigro International Competition (2004), Muriel Taylor Cello Competition (2014), and Bromsgrove International Competition (2015), Aliyev has also won; "RCM Concerto Competition 2014", "RCM Violoncello Competition 2014", "RCM Concerto Competition 2015", “RCM Violoncello Competition 2015” and “Croydon Concerto Competition 2015”. Aliyev is a recipient of four "full scholarship" awards from Royal College of Music, Royal Academy, The Yehudi Menuhin School and the Central Music School of Moscow. 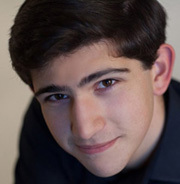 Began his musical studies at age five with his first teacher and beloved grandfather Kara Aliyev in Turkey before moving to the Yehudi Menuhin School in 2008, to study with professor Thomas Carroll who he is currently continuing with at the Royal College of Music, London - UK. Jamal Aliyev is generously sponsored by; Neville Wathen Scholar supported by an Amaryllis Fleming Award, Hattori Foundation, Talent Unlimited and the Bowerman family. Jamal Aliyev plays on a Giovanni Battista Gabrielli 1752.